Lyon & Healy Style ‘E’ Washburn c. 1923 | SOLD | The Lyon & Healy factory in Chicago had been producing quality Washburn guitar for decades. These were well made instruments, on par with Martin, some of very high quality and adornment. In the early twenties, the Washburn 1923 -1924 Series was introduced. This line departed from the the more ornate Washburn offerings, with the 1923 - 1924 Series guitars being a bit more austere in their adornment. 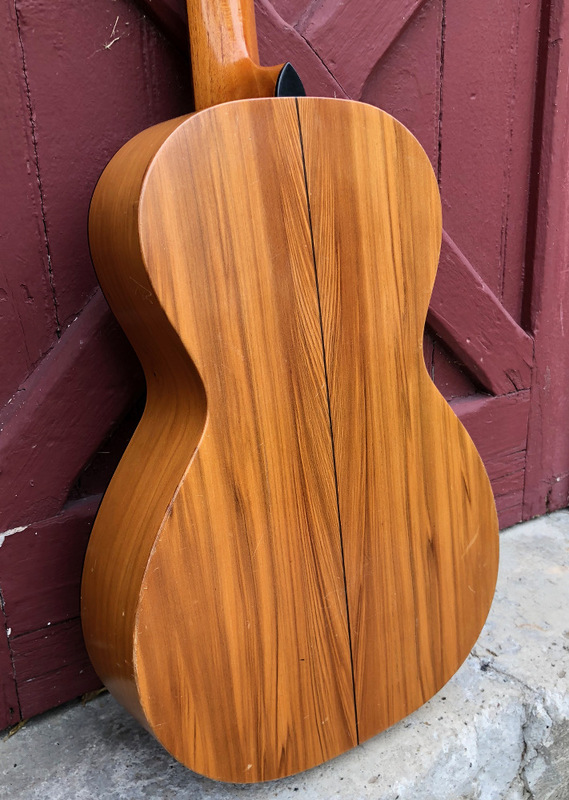 The Lyon & Healy catalog of the period describes the Style E as, “A standard size instrument of selected (ply) Nyssawood, chosen because of its beautiful grain.” The Nyssawood (aka pear wood) on this particular, near mint example, is quite fanciful, and attractive to the eye. The top is spruce bound in black celluloid, sporting a raised black celluloid sound hole ring. The “improved” bridge is rosewood in the ‘smile’ profile favored by Washburn in this era. The cedar neck is topped with a rosewood fingerboard with 18 frets, and position markers at 5, 7, 10 and 12. The nickel plated tuners have black buttons. The end pin is rosewood. The bracing is ladder style with the top brace just below the sound hole on a bias, common in many Chicago-built guitars. “Lyon & Healy Makers, Chicago, USA” is stamped on the back strip, 6607 ink-stamped on the heel block, “Style E Washburn” embossed on the back of the headstock and “PAT APLD FOR” on top of the headstock. The ‘standard’ size body measures 13” across the lower bout. Scale length is 24 7/8”, and the neck measures 1 7/8” across at the nut with string spacing 2 5/16” at the saddle. The guitar appears completely original but for likely replaced bridge pins. The condition is as fine as one would hope to see from a guitar of this era, with no evident repairs, and minimal nicks and play wear. The neck was recently reset, and a new saddle installed. The guitar plays easily, and produces nice boxy sound, more bright than deep, with good sustain and a pleasing ring. An intriguing and rather rare instrument! Comes with a newer soft case.